Paul the Bowman came over on today for another run out of General D'Armee using my French Revolutionary Wars armies. This was Paul's first game with the rules and only my second. 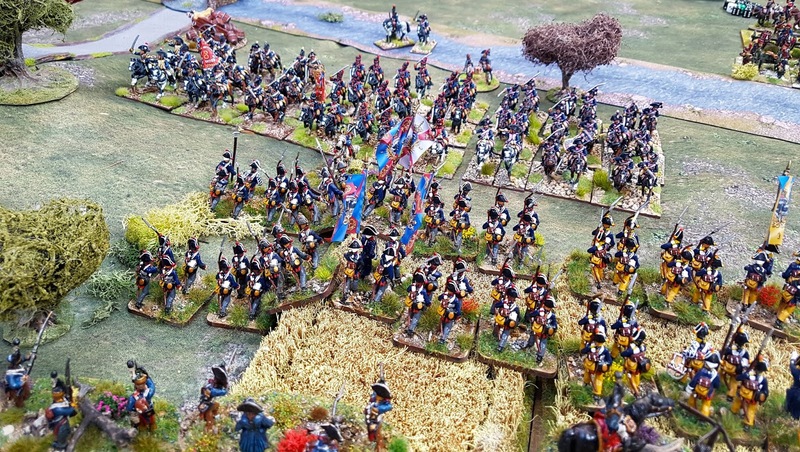 I stuck with French and Prussians 'somewhere along the Rhine 1793' as the basis for the scenario, but with more troops! 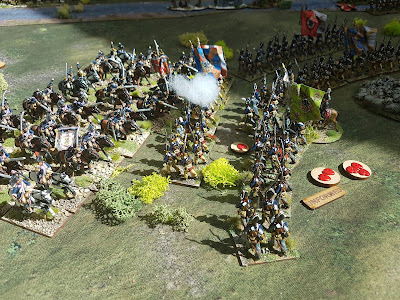 This gave us a mixed bag of French and an equally mixed bag of Prussians. I may be a little harsh to the latter but I don't rate them very highly based in what I know of their lacklustre contribution to the War of the 1st Coalition. I made the French commander excellent and the Prussian one poor, which have the former the edge (in theory) in terms of ADC generation. 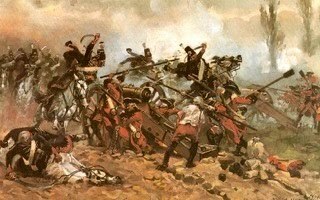 Most of the French were classed as 'line' but would shoot on the 'recruit' line on the firing table, and half the infantry were classed as 'recruits' in all things. This was meant to be 1793 remember. The artillery were line as were the cavalry, what there was of it. 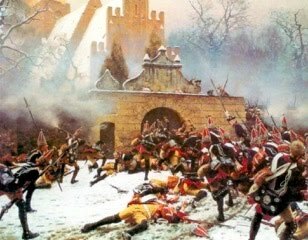 The Prussians had three enormous regiments of heavy cavalry (cuirassiers and dragoons), a 'light' brigade of three fusilier battalions and attached jager, and four brigades of musketeers. Early Prussians get a pretty raw deal in the rules (quite rightly) so they were all classed as 'line'. 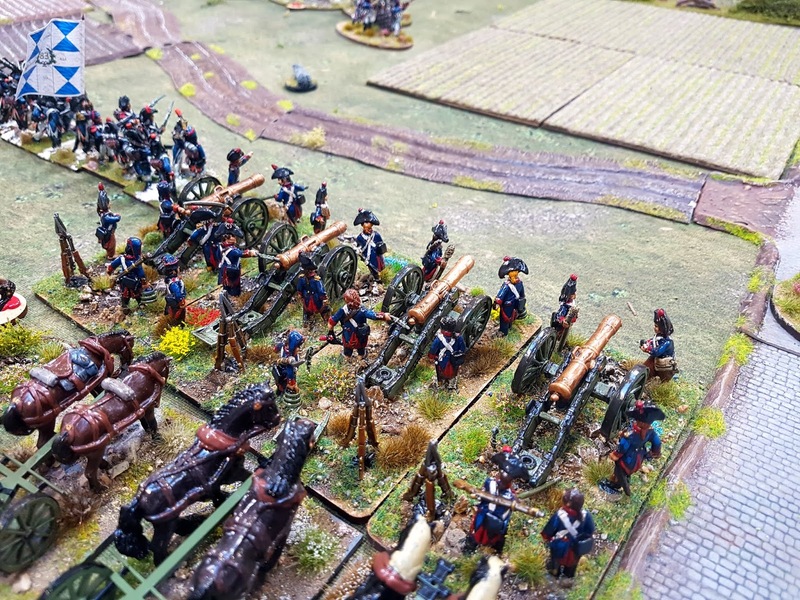 The three Prussian artillery batteries were classed as line. 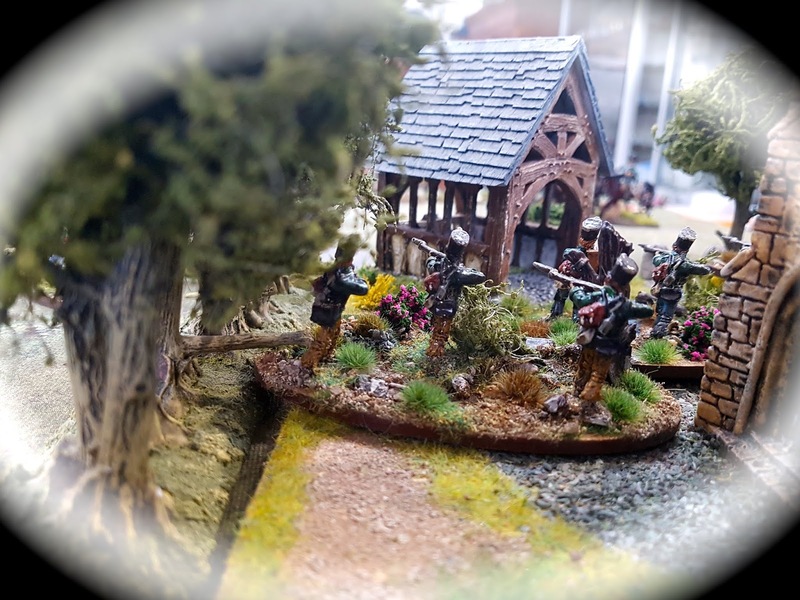 The scenario was fairly vague as I wanted to put the rules to the test again and hopefully not forget as much as I did last week. Paul was keen to give them a try and was happy to take the French. 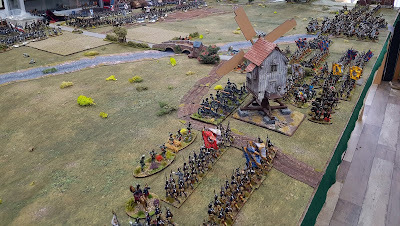 I decided that the Prussians would be on the offensive. Yeah right! 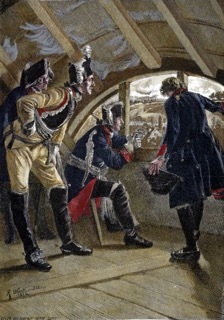 The French had clouds of skirmishers screening their troops. 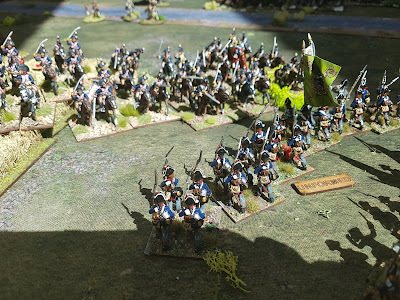 Most of my infantry brigades could only generate two bases of skirmishers, the exception being the fusilier brigade, posted on my right flank. 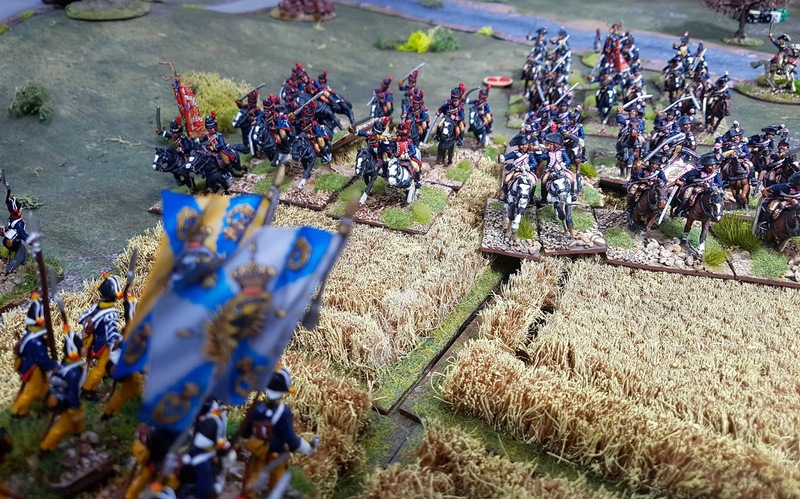 The Prussian advance was far from co-ordinated due to poor ADC availability and more so due to my ability to throw lots of 1s and 2s when trying to activate brigades. I also was to loose all bar a couple of initiative throws to the French. As usual I shall let the photos tell the story of how the game played out. 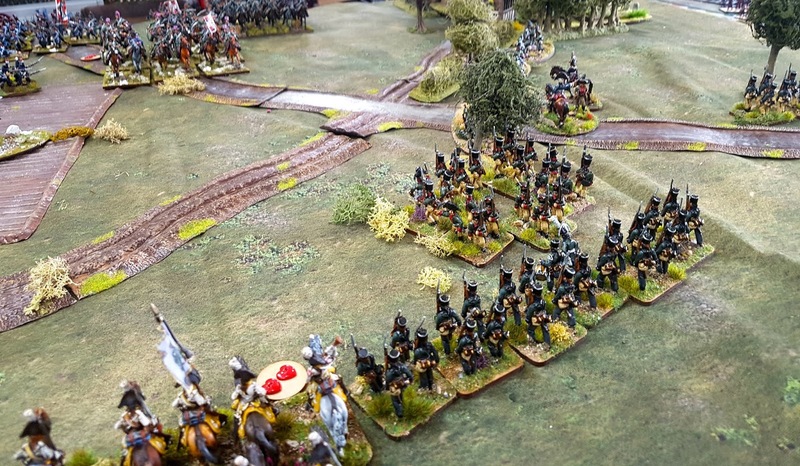 The Prussian army deployed to advance while the French in the distance look on. 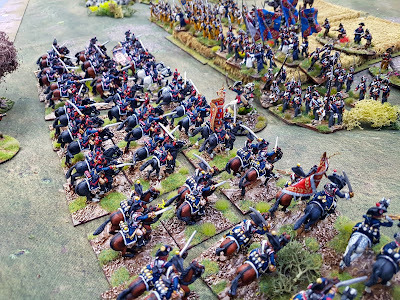 The French heavy cavalry brigade on their right wing. They were to be instrumental in the outcome of the battle. The French centre and left. In turn one they were immobile as a lack of ADCs and/or failing command rolls kept them anchored to the spot. Obviously fearful of the might of the Prussian army before them! 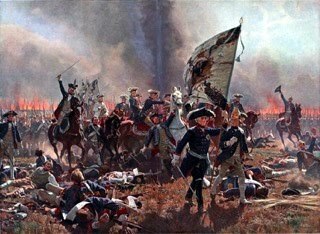 The Prussian right. 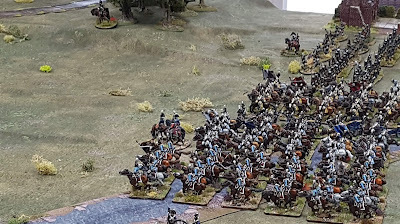 Their cavalry brigade and in the distance the fusiliers and jager of their 'light' brigade. As does their left wing. 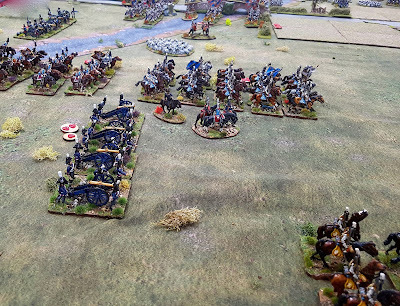 Impatient to get to grips with the French my Prussians overextended themselves and were charged by Paul's heavy cavalry. 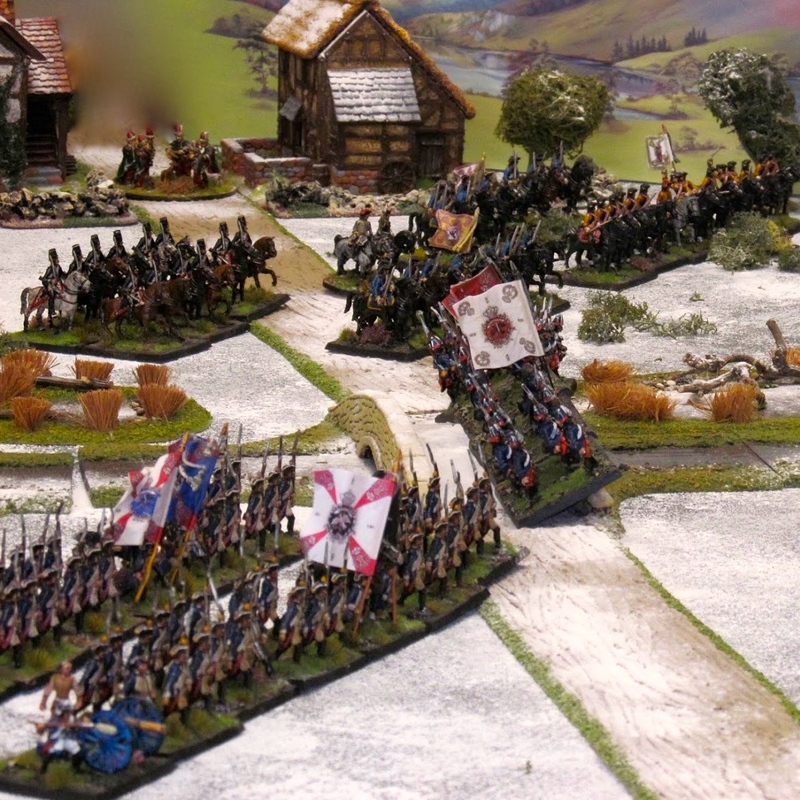 The 2nd Carabiniers in the centre led the charge supported by the 8th and 23rd (Pinko Parisien Ladyboys) regiments. 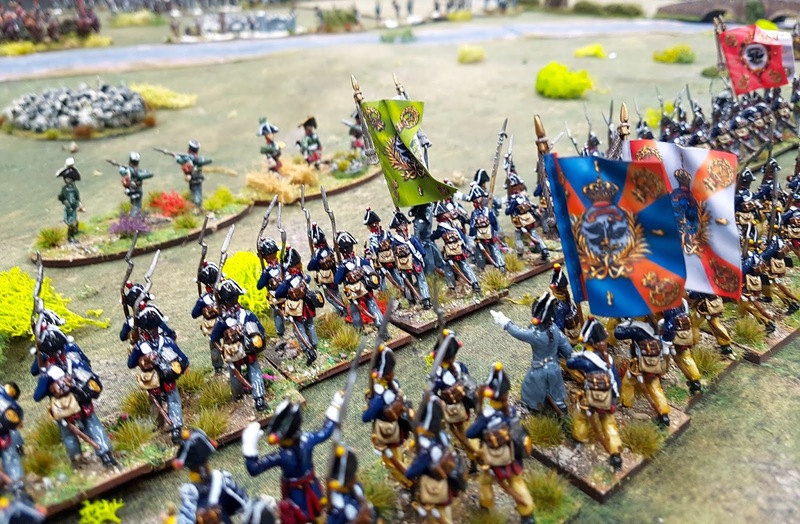 The Prussian battalion facing the charge failed their discipline test and became unformed and unable to form square. They were swept away. The Prussian left wing was now classed as faltering. Bum! Paul pulled the Carabiniers back the following turn as my remaining battalions had formed square. The Prussian centre seen from behind the French line. The former were making heavy going of their advance and progress was slow. 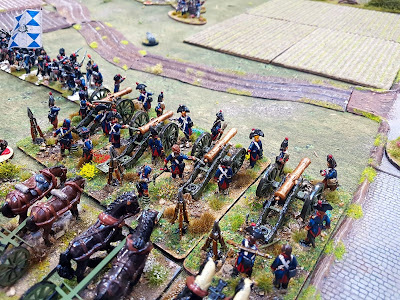 The French reserve artillery battery of 12pdrs was knocking lumps off my cavalry which was also struggling to advance, assuming they were daft enough to want to try that is! Funnily, Paul lost more casualties to fatigue among his artillery, especially this battery, than through enemy fire, a fate that was also to befall my horse artillery supporting the cavalry. My jager and fusiliers occupied the wooded hill facing the French left. Temporary stalemate on my left. 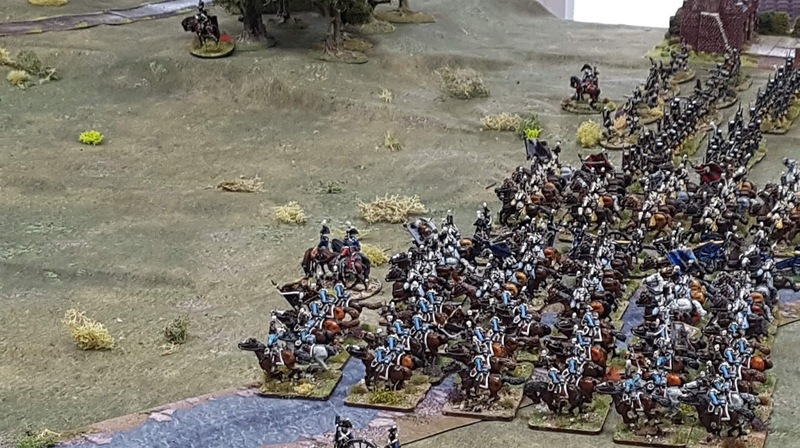 However, the attention of the French horse artillery soon caused crippling casualties on the French in square, causing one battalion to disperse (run away). 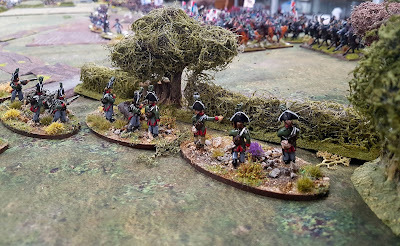 The brigade had passed its first faltering brigade test but the following turn I threw low and it was 'sauve qui peut!' 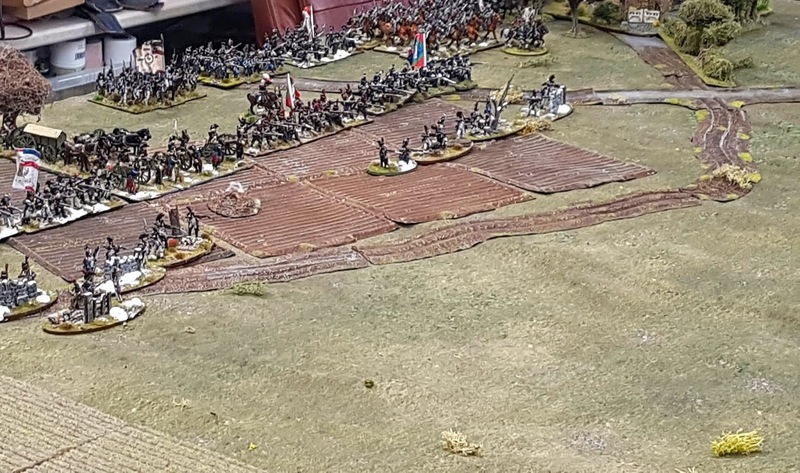 and the brigade fell back. 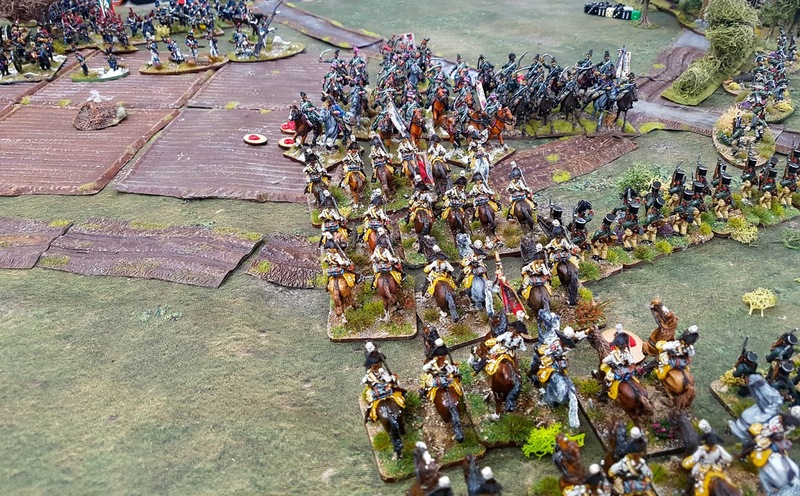 I could just not get my cavalry to charge. Meanwhile they were now taking hits from two batteries of artillery. 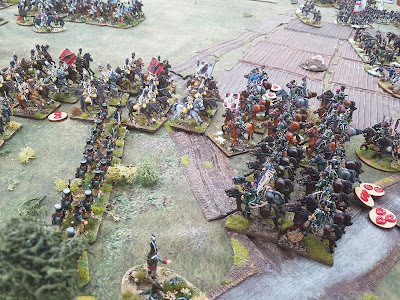 The psychological effect of three great big Prussian regiments to their front, together with the galling fire of the advancing Prussian fusiliers and jager caused Paul to pull his left flank back and put his infantry into square, but I was unable to exploit this fully. 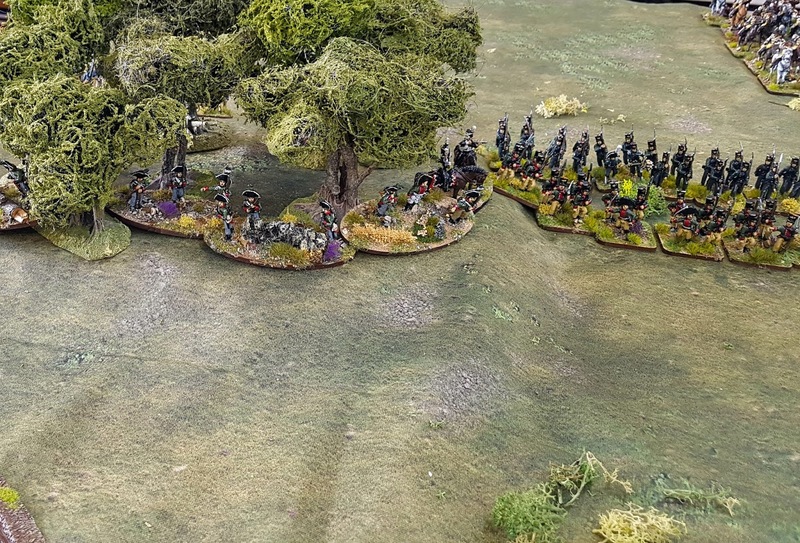 The Prussian fusiliers advanced out of the woods. 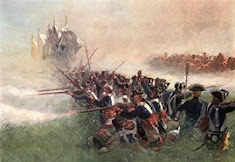 One battalion was forced into square by French chasseurs a cheval, but forced the French to retreat. 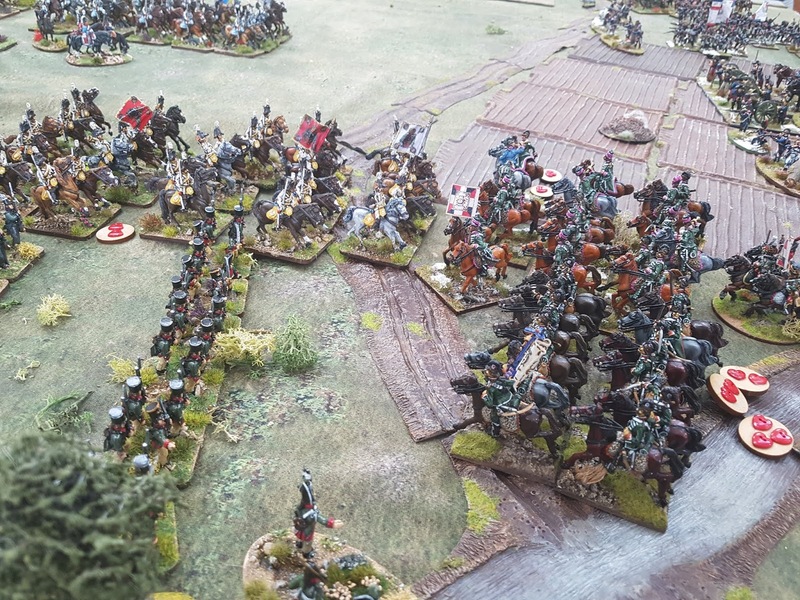 My skirmishers and jager occupied the churchyard and hedgerows and caused crippling casualties on Paul's light cavalry. Jager adding to the French cavalry's discomfort. 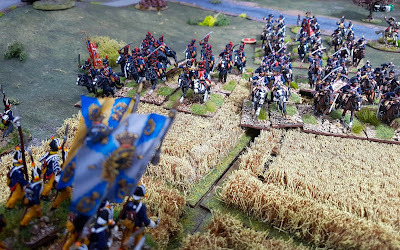 Paul's cavalry swept forward now one of my brigades had been driven off. 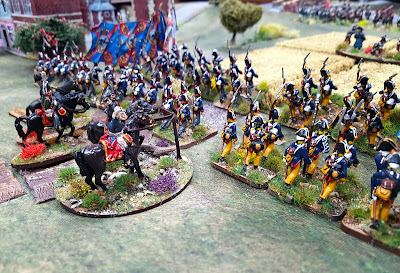 My leading battalion had failed a discipline test and become unformed, making them a juicy target for the French cavalry. 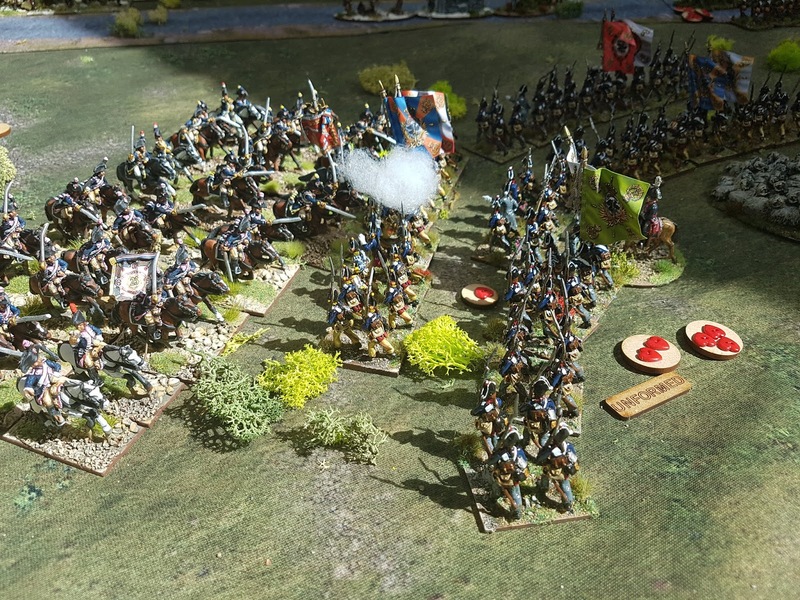 The front Prussian battalion was forced to retreat in the face of the French charge leaving the battalion to their rear exposed. This battalion decided discretion was the better part of valour and ran! Back on the other flank the French charged my cuirassiers who counter charged and unsurprisingly drove them off. At least Prussian honour was saved by the action of their cuirassiers. 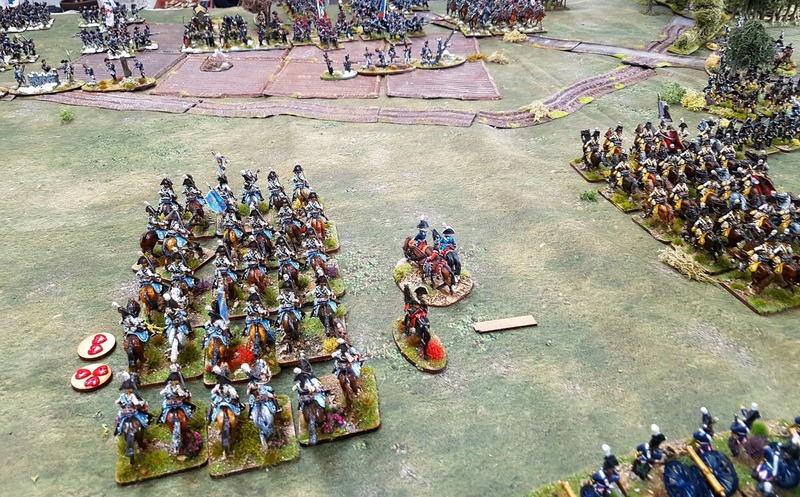 Although it would have been much more satisfying if the other two regiments and their supporting horse artillery had actually done anything! 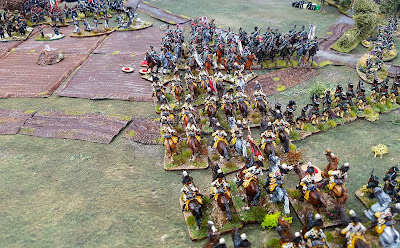 So with my left flank crumbling I threw in the towel and ordered a withdrawal, covered by my still vastly superior cavalry. I'm getting the hang of the rules and am warming to them quite nicely. They are actually very straightforward and much more satisfying than Black Powder. Now, I do like Black Powder, but I do tire sometimes of all those special rules and saving throws. I have another game arranged for Friday so lets see how we get on with the rules on the third attempt. Superb collection Colin, and fine BatRep. Quite gentlemanly to allow your guest a victory in his first outing. Magnificent. First class. Inspirational stuff. Thanks for the write up and observation. I have the rules (and the sister set Pickett's Charge) so will pull the books for another look. As always a fine looking game, but I’ll stick with BP thanks. More Marmite David 😜😉 I will probably flutter between each set depending upon mood, the scenario, the weather and end up unconsciously mixing them up and playing something called General de Powder! To be honest GdA do seem especially harsh on early Prussians, Austrians and Russians as written but can be tweaked. I’ll play BP with you of course. Lovely looking game and an intriguing set of rules. Great looking game with beautiful figures and terrain Colin. Look forward to reading about the next encounter! 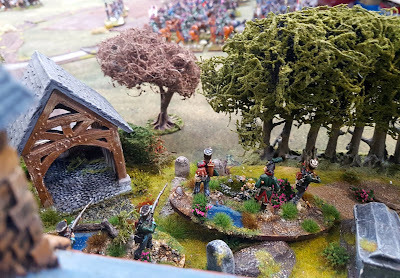 Brilliant figures and terrain. Great AAR. Very inspirational.